Reading Red Rising and Golden Son in three days total was an... interesting idea. 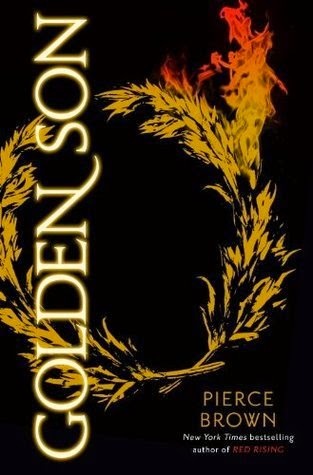 I read Red Rising on Thursday, and started Golden Son on Friday, finishing it on Saturday. Literally over eight hundred pages... gosh, these books. I'm really enjoying the series, though I have had a serious feeling of dread and sorrow throughout the books, regardless of the tone of each successive scene. It's like I expect everyone to fail and everyone to die, in the end. I really wouldn't be surprised. This book sort of blew my mind. Both books, really. It's truly amazing how Brown crafts the story, the world, the characters. Brown delves right into the heart and soul of war, or battle, of vengeance, of survival. He pulls out every great and terrible thing that comes with war. This whole book had an undercurrent of high stakes, danger, betrayal, endless battle. One spot of violence snowballed into an ocean. Brown really weaves a brutal and raw story of war. This is true dystopia, with all the blood and death and violence and terrible consequences. You can literally see Darrow breaking down and falling apart and coming back together. Brown does a fabulous job of making Darrow a very, very realistic character at war. Darrow has always been a prodigy in terms of intelligence and cleverness and thinking, and he really used those qualities in this book. There were so many times when Darrow should have shut down, but he kept going. Lots and lots of things happen in this book - I can't even begin to scratch the surface. It's a long book, but also very dense. A lot happens in a short space, as well as very little could be revealed in a long space. I love how intricate the plot is though. It feels like the skirmishes keep coming, the war never ending. When does Darrow sleep?! It's so cool how Brown surprises readers with little things that he doesn't reveal until it's thrown in readers' faces. Like, this novel is written in the first person, but Brown writes in a way so that Darrow doesn't really everything to readers. For example, Darrow was doing something very sneaky and dangerous behind his friends' (and Society's) backs... and no one found out until he revealed it. NO ONE, including the readers. I thought this was really cool. I could see readers getting confused though, because it's like, did I miss something?! Nope, Brown is being tricksy. In this novel, Darrow grows as a character, even more so than in the first book. The decisions he has to make - it's hard to fault him for withholding his plans from some friends and not others, or for having plan upon plan upon plan, or for threatening or manipulating some people. He thinks he's a terrible, and for his actions, he might be, but a true leader isn't innocent. Darrow learns to trust some - only to be burned by others, or drawn close. But Darrow learns some hard lessons. I feel so bad for him, during the entire book. The romance is weird, in this series in general. I have no idea what Brown is doing with the romance, and I can't see how he's going to end the series (in terms of the romance). It could go in a million directions, especially after this book - from start to finish. Mustang hurts Darrow infinitely, and Darrow has indirectly hurt her all along. Their relationship... it's so screwed up, like so many relationships in the real world, and I like this, but I don't know what to think! I'm just going to say it - the book ends in a cliffhanger. Huge, giant, massive, colossal, heartbreaking cliffhanger. Typical sequel novel cliffhanger. I hate/love it. Hate because AGH. Love because AGH. It makes sense, and you know it's coming, but AGH. I need book three! Just like in Red Rising, this book is long (even longer than Red Rising)... and it certainly feels that way. Again, I usually have no problems with long books. But this one felt its length (and then some). I felt like I read three books in the time that it took me to read this one. But this book is very dense, as is Red Rising. So it's understandable. And perhaps I wouldn't mind as much, if I hadn't decided to read these books during finals week. Hmph. YES. I would totally recommend this sequel novel, especially if you've already read Red Rising. If you haven't read book one, then perhaps wait until closer to book three's release (hopefully in 2016 or sooner), because the cliffhanger in this book will wreak havoc on your heart. But seriously, this is an awesome science fiction series! Definitely one of the best dystopia series I've read (and I've read plenty). Perhaps because it's adult fiction? 4 stars. Holy guacamole, this book. I think I'm still trying to process everything that happened. There's so much cruel craziness and then some good things and then more cruel craziness and everything is so interesting and I WANT MORE! I knew it... I knew this one was one have a cliffhanger and I was in denial!! I still haven't finished it because I'm reading it and another book for a buddy read so what few reading time I have at night after work gets divided between them, but boy this book is EPIC! OMG PILI. You must finish soon! I can't even begin to understand this book - it's some craziness! Hope you love it! IT IS SO SAD, TO KNOW FROM THE BEGINNING THAT THE ENDING WILL BE SAD. Or so we expect. At least Brown doesn't sugarcoat anything. I'll have to leave you to your own devices, about the romance ;) You kind of have to read it to understand. Heh. The novel overall has a sad tone, and not because of the romance. But anyway. You're very welcome!